Broken links are something I didn't even think about until recently. When you first start blogging you don't even think about SEO or most of us don't even know what it is. You certainly pick things up along the way. Search Engine Optimization aka SEO is something you should be doing for your blog. If you want to know more about what SEO is and some easy tips on how to improve yours you can read my 6 Easy SEO Tips post. 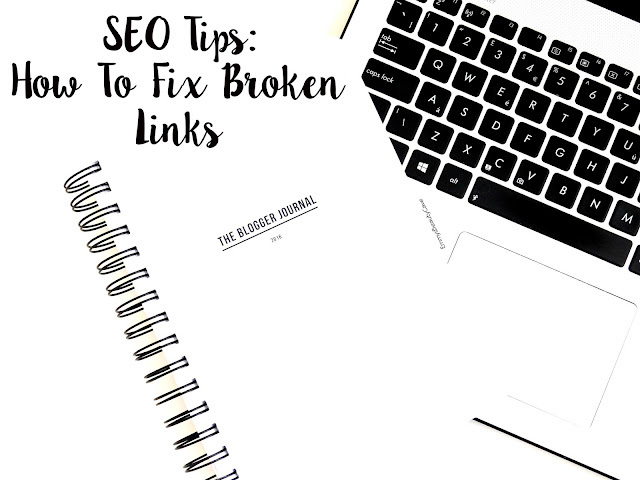 This is my second post in my Blog Tips series and it is all about How To Fix Broken Links on Your Blog/Website. Broken Links is just a small part that can help improve your SEO. Without us realising it our blogs/websites will get broken links on a regular basis. It isn't something we can prevent but it is something we can fix. Every time we put a link into our blog and our blogs blog-posts it has potential of eventually getting broken. The most common reasons for broken links can be that the website you linked to has now moved that product elsewhere or the website is no longer there. Also when people comment on your blog and leave a comment with a link e.g. their blog link, this can also have potential of becoming a broken link. 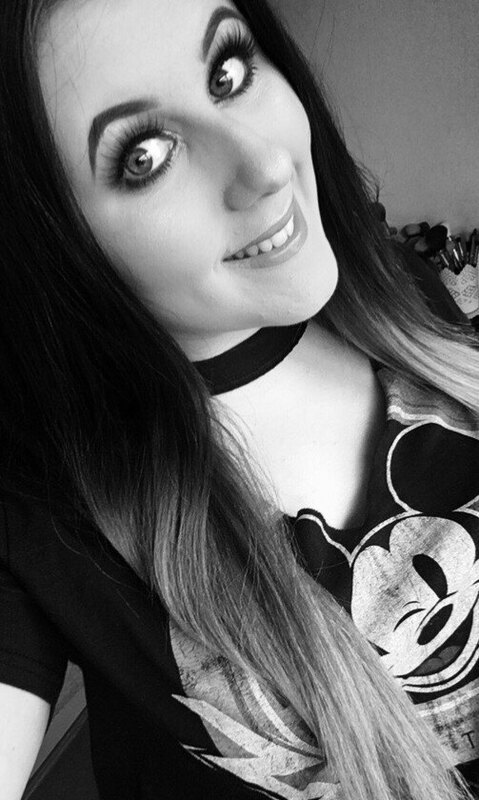 I had been blogging over 18 months and hadn't checked my broken links once! If im honest I didn't even think of it or even knew it existed. I used Broken Link Check to find my blogs broken links. It is free and all you have to do is put in your blog url and click search. The search can take a little while as it has to scan through your whole blog and it will depend on how many posts and links you have. Note Broken Link Check can only search 3000 web pages in one go as it is free. So once you have done it, do it again to make sure you have got all the broken links. If you are scanning broken links for the first time and you have been blogging a while note you may end up with alot of broken links. As I said I had been blogging around 18 months the first time I did the scan and I ended up with around 100-120 broken links. This literally took me hours to go through. I now scan for broken links every 3-4 weeks and usually get between 10-20 at most. These are just a couple of the broken links I had recently. You will end up with so many different types of links but don't worry as it is pretty easy to fix once you get the hang of it. 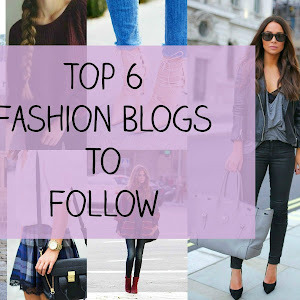 You will get a list like the one above and it will have websites, blogs and more. All you need to pay attention to is the URL and SRC on the right hand side. If you click on the URL it will take you to the page on your blog where the broken link is located. If the link shows up as a website eg. Disney Store, Boots etc... these are quite easy as you can just amend the link the correct website. To remove this type of link just go into blogger or wordpress and edit the post or remove the link. 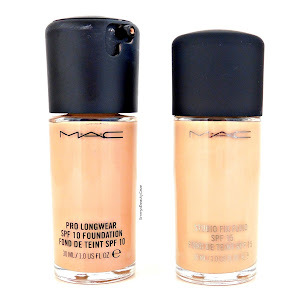 If the product in question has just been moved on the site then change the link to the correct one. Some of the broken links will show up as a blog URL. So it will be the website of a blogger. This means it is a comment left by that blogger with the blog link. If you click the URL on Broken Link Check (on the right hand side column on the above picture) it will take you to the post where the comment has been left. You can then scroll through your comments until you come across the blog link. If on Broken Link Check it doesn't show the full blog name you can also click on SRC. This will bring up the HTML coding (as below) and you can locate the blogger link and the comment left so it is easy to then locate in the comments section. 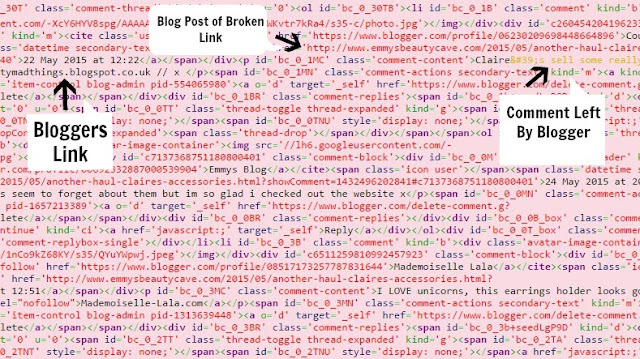 I found over half of my broken links were comments left by bloggers. I had one person who came up over 30 times in different posts. It seemed she had deleted her blog so it no longer existed which causes all of the broken links on my blog from where the comment was left. 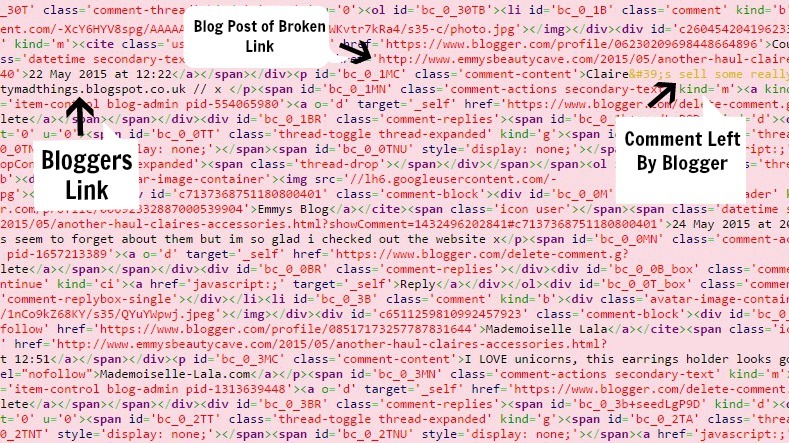 Once in the html as below press CTRL & F at the same time then type in the blog url that shows up on Broken Link Checker and it will highlight the comment from that blogger so you know what to look out for. If you have the original google comments on blogger just click delete on the comment and make sure you tick the Delete Forever box! On Disqus you simply just click delete. You can also log directly into disqus and search the bloggers name and it will show up every comment left by the blogger and you can delete them via Disqus. If you used to use the blogger comments and then switched to Disqus you won't be able to find the comment left on Disqus if the comment was left before you switched over. To fix this you will need to go into the Blogger Dashboard and on the sidebar go to Comments. Check the src part on Broken Link Checker and do the CTRL + F with the blog link to find the date of when the comment was left. Then you will need to find the comment in the blogger dashboard by going to the date. Underneath each comment in the blogger dashboard comments section you can just click delete. To give you an idea I took a screenshot of one off mine. You can see where it says which blog post the comment was on, then just after that in yellow it shows the comment the blogger had left. Then after the comment it shows you the link that is broken and in this case it was the link to the bloggers site. It can be for many reasons so don't worry if you show up on someone else's as a broken link. I had the odd broken link I just couldn't find for hours, don't worry if your blog still has a couple of broken links. As long as you get rid of the main bulk of them you are good to go. I will now be checking my broken links once a month so I can keep on top of them. It does seem daunting at first but you will get the hang of it quickly and it is a good way to help improve your blogs SEO. If you are not to sure about SEO and all that jazz check out my All About SEO + 6 Easy Tips To Improve Yours.